Today, the Bridgeport Commemorative Silver Half Dollar Coin remembers the city’s centennial celebration on November 12, 1900. City Decked Out In Its Gayest to Honor Centennial. Bridgeport, Nov. 12. Bridgeport’s centennial celebration is smiled upon by the heavens today. The storm gods missed a royal sacrifice when they wasted their strength on the common days of last week, whereas they might have saved it for the discomfiture of the thousands who have been looking forward to this day for many a long week. The uncertain skies of November have been kind, however, and all Bridgeport and all Connecticut with her rejoice. At an early hour this morning it was evident that a tremendous number of strangers would be in the city. Every train brought hundreds and from the earliest hour the streets were full of holiday makers. Everywhere were heard words of the highest admiration for the extensive decorations which all agreed have never been equaled in the state. There were more street merchants, fakirs and venders of alleged souvenirs in the streets than have ever gathered in this city before. They have been numerous for several days; this morning they swarmed. The air has been full of sound all day. The rataplan of drums and the student strains of brass instruments have been as common as snowflakes in a blizzard. The invited guests arrived early in the forenoon and were served with a light luncheon at the Algonquin club. Governor Lounsbury’s visit here is the first he has made in his official capacity to this city. The parade started promptly at 1 o’clock. It contains 19 divisions, over 20,000 men, 28 drum corps and 17 bands, 50 autos, 100 floats and dozens of fire engines and trucks. It was reviewed by Governor Lounsbury at the City hall. Tonight there will be a big banquet at Masonic temple. Governor Lounsbury, Senators Piatt and Hawley, Congressmen Russell and Hill, Mayor Driscoll of New Haven and Mayor Harbison of Hartford will be the speakers. There is to be a night parade, fireworks at Beardsley park and a wind-up jubilee at the armory. 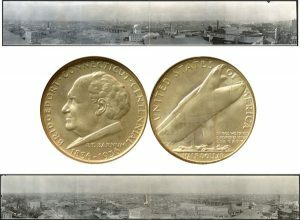 The Bridgeport Commemorative Silver Half Dollar Coin shows with panoramic images of the city, circa 1909.